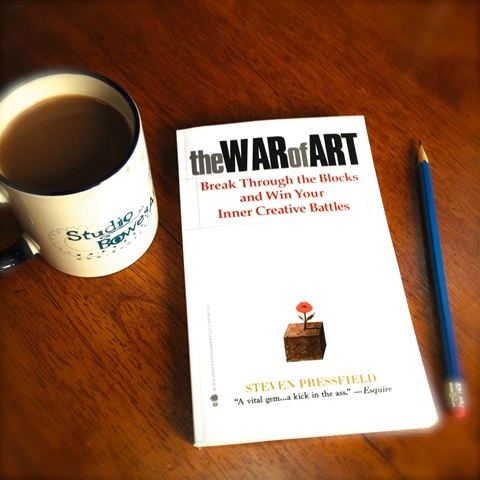 The War of Art: Break Through the Blocks and Win Your Inner Creative Battles, by Steven Pressfield. The author of this web site, who had been playing the organ for well over half a century prior to and up through the year of grace 2014, had never written a single note of original organ music in his entire life and never thought he could. Never, that is, until he was directed to this little book. Since then the world now has 28 Opus numbers arranged in 4 major collections of new, original organ music in it that it didn't have before -- all due to reading this little book and putting into practice what it has to say. This little book The War of Art happened to resonate very loudly with the creator of this web site. Its first section describes the counterforce to achievement, what it is, the ways it manifests itself, and lays out an alleghorical enemy worthy of an epic struggle. The second section is mostly about the way a professional behaves and how this behavior overcomes this enemy, leaning more toward inspiration than prescription. The third section introduces certain religious aspects which reflect's Pressfield's mental model of the creative struggle. Rationalists will claim the book goes completely off the rails in this third section, accusing it of espousing shoot-from-the-hip pop psychology, making a deep dive into the ego ignoring its conventional definition, redefining it for Pressfield's own purposes, and for making outlandish claims without any evidence to support them. Those who align their thinking with the agnostic method and will not permit reason to function outside of its trappings [See menu bar, Bio, subpage The Reality Of God] will also claim that "guru-itis" and "cultism" are all around us and is especially attractive to those disappointed individuals who seek assurance in the face of a lack of evidence, thus the apparent approach of this book. They will claim that gurus and cultists always align themselves with God as their authority, for which there is no evidence whatsoever. They will also make the claim, falsely, that no one will be changed by reading this book but they may be assured and hopeful for a while. The truth is, the evidence is in, and this little book changed the life of this author and honed him into an emerging, published composer. This is a provable fact, and the plain evidence is there for anyone to see, hear, and experience for themselves [See menu bar, Free Stuff]. In a similar way it has helped countless others to express their creativity. This book is not a science book; it's a self-help book. As a reader of it, I'm not expecting to find scientific proofs. I'm looking for authenticity. And this book is authentic. If someone wants to get scientific proofs, then they need to read a science book. My feeling is, book reviewers should not be telling whole groups of people whether or not they will like this book; they should merely express their own opinion. People are all wired differently, and not everyone thinks like the reviewer. I would nevertheless advise anyone who wishes to experience the same to get a copy of this title for themselves and read it first for general style to see for themselves whether any of it resonates with them. Then go back and read it a second time slowly, for content. I would then keep it handy and read through it from time to time, again and again. If you've ever thought about doing something new to uplift yourself to a higher level of attainment, growth, or development -- something that makes use of your natural gifts such as by enrolling in a new educational program or study, beginning a new exercise or weight loss program, starting a new hobby or taking the hobby you have to the next level, constructing a work of art, or beginning to build something you always wanted to build -- but you don't have the slightest idea how to break through what's holding you back ... AND if you're willing to acknowledge that a creative artist can come by knowledge, thoughts, insights, and ideas by certain means outside the 5 physical senses and that works of art derive their inspiration from where all creation has its home -- then this book is probably for you. It's no exaggeration to say that, save for the Holy Bible, this is probably the most important book anyone could ever own and read. It explains, among other things, how someone can unplug themselves from the grid of self-doubt and realize their fullest God-given potential. The language used is a bit frisky in places, but, the simple truth is, there's no finer description of the process in print. In this musician's case, it showed him what was standing in his way from composing some effective, useful, and interesting pieces for the pipe organ, something that he's always wanted to do, wished he could do, was too scared to do, and had himself convinced that he could NOT do. Author Seth Godin has written another book called Linchpin: Are You Indispensable?, which devotes an entire chapter to the very same subject [See blog, The Book, Part II].